Your consultation will be with an experienced loft builder as we do not employ sales people. We will discuss your requirements and carry out a survey to attain all the dimensions we need to give you a proposed loft floor plan, including room layouts and sizes along with your quotation. Your consultation is free, an ideal opportunity for you to see how much space you can gain without having to commit to a deposit. Once you are ready to go ahead, we will instruct our architect to survey the property and get to work on your architectural drawings. Once you are ready to go ahead, we will instruct our architect to survey the property and get to work on your architectural drawings. Most conversions fall under permitted development and require no planning permission, in which case we would apply for your lawful development certificate. However if planning is required, our experienced team can help with planning approval. Full plans and structural calculations will be submitted to the necessary Building Control authority for approval before works commence. Full plans and structural calculations will be submitted to the necessary Building Control authority for approval before works commence. Inspections are carried out throughout the process, ensuring the work sufficiently meets Building Regulation Approval. Once satisfied they will issue a completion certificate to you. We understand it can be difficult to picture what your new converted space would be like and what you could gain, where your stairs would go and whether you would have enough space for an ensuite or wardrobes. 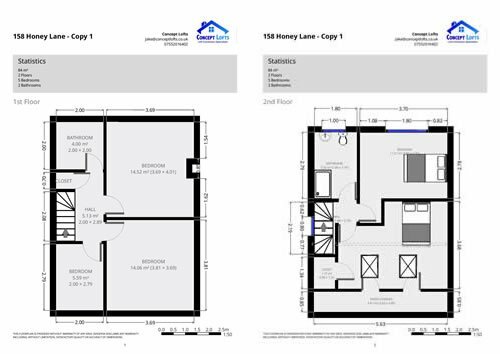 On our initial consultation at your property, we do a 1st floor and loft survey which gives us all the dimensions we need to give you a proposed loft floor plan, before asking you to commit to a deposit. This would be given to you with your free no obligation quotation. Concept Lofts are proud designers and installers of high-quality loft conversions and extensions. We carry out loft installations throughout Essex, Hertfordshire London and the South East. Whether it’s to create a master bedroom and En suite, a home office or kids’ bedrooms, we handle everything from planning permission to architectural design and construction. We offer competitive prices on professional loft conversions and approach every project individually. We are passionate about creating bespoke loft spaces that add genuine value to your property. We understand that your day to day lives must continue with minimum disruption, so our promise is to reach completion in the shortest possible time. All whilst you continue your everyday lives awaiting that fabulous extra space. It all starts in your mind… “The Concept” …what you can do with your loft space is often based on what you already have. However, we all have different ideas, needs and budgets, making every conversion unique. By working closely together we can provide the solution that meets your needs perfectly.Whether it’s a Velux conversion, smaller pitched roof dormer conversion, full rear dormer conversion, Trussed roof conversion, rear addition L shaped conversion or Mansard conversion, we have the experience and expert team to fully manage the project from start to finish. The extra space needed for you and your family is already in your home. Extend your living space seamlessly and cost-effectively by converting your loft or attic and adding value to your home. Concept Lofts are a very professional and reliable company, at the end of each day they ensured the house was tidy and clear of any rubbish / mess. The workmen are all friendly and very polite.